October 2002 recording of improvisations and songs by the late Jutok Kaneko (guitar, vocals) and Takahisa Kikukawa (drums). 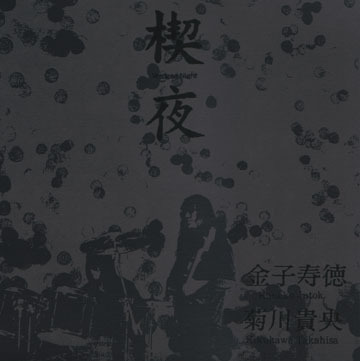 Jutok Kaneko should be familiar to some as the man behind the long running deep psychedelic 'rock' outfit Kousokuya. Takahisa Kikukawa spent some time with Che-Shizu, UZU and has also performed with Suishou no Fune. Both in Kousokuya and in Kaneko's solo work the line between composition and improvisation is a very blurry one so it's only in the loosest of terms that we say side one of this album is an "improvisation" and side two consists of a couple of "songs". The LP is issued in a one off limited run of 500 and comes in an appropriately black and black on black silkscreened cover with two screened inserts. mp3 (1.96MB) Excerpt from "Buried Memories"